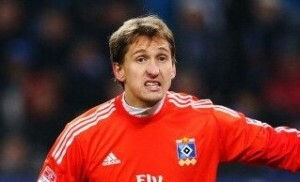 Reports are out claiming that Hamburg have denied that Arsenal have not made an approach for their highly-rated keeper Rene Adler. General manager Frank Arnesen told Bild : “It’s obviously a fact Arsenal FC is on the search for a goalkeeper. But thus far no-one from Arsenal FC has been in touch with our club,”. Adler himself admits that he is flattered to be linked with the Gunners. “I am under contract with Hamburger, but for every professional it will be a pleasure and honour to get linked with a club like this,” Adler, who has four years left on his current deal, stated.